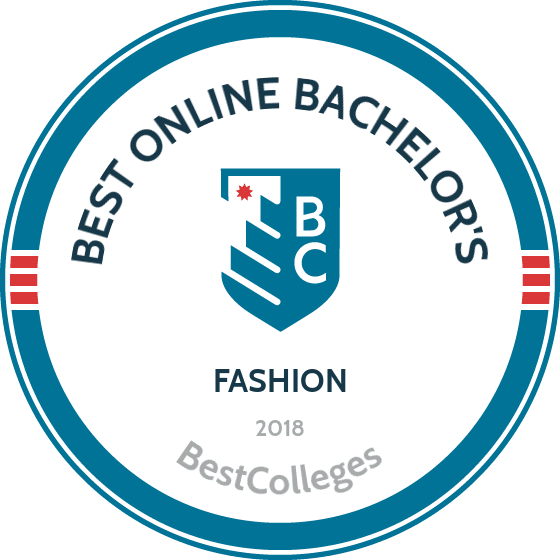 What are the Best Online Bachelor's in Fashion Programs? What Else Can I Expect From an Online Bachelor's in Fashion Program? Fashion is a popular career choice for creatives seeking to earn an above-average salary. According to the U.S. Bureau of Labor Statistics (BLS), American fashion designers earned a median salary of approximately $65,000 in 2016. Additionally, the field is growing, and the BLS projects that the economy will add about 600 positions in fashion design by 2026. Data shows that fashion design is a strong career choice for people who want to live in coastal enclaves like Los Angeles or New York City, as California and New York are home to 73.8% of the industry's jobs throughout the country. Those states also offer the highest-paying jobs in the industry, with employers in New York paying a median salary of nearly $84,000 and those in California offering a median salary of more than $76,000. Most online fashion programs award degrees in either fashion merchandising or fashion design. While merchandising programs have a more business-oriented feel -- often featuring coursework in retail, product development, and visual merchandising -- design programs take more of an artistic and craft-based approach, offering classes in textiles, fashion illustration, and apparel design. Students pursuing a fashion merchandising bachelor's degree online focus more on the industry, completing coursework related to the history of fashion and retail management. Students pursuing a bachelor's degree in fashion design online may have the opportunity to attend lectures from guest speakers in the industry. Additionally, most fashion design programs offer students the chance to participate in workshops where they create items and receive feedback about their work. As many of these courses involve elements of hands-on work, many fashion design programs do not include a specific capstone requirement. In general, the field does not offer a wide variety of concentrations. Instead, prospective students should ask themselves whether they want to spend the majority of their time making fashion or selling fashion. The answer to this question should help prospective students choose which online programs best fit their academic and career goals. The highly regarded University of Wisconsin-Madison has developed an innovative bachelor of science in textiles and fashion design program that offers students the chance to participate in exclusive learning opportunities. Students can opt to showcase their developing skills in an annual on-campus fashion show, and seniors can apply to spend their final year training for industry opportunities at the acclaimed Fashion Institute of Technology (FIT) in New York City. The program boasts a graduation rate of 85 percent, indicating high levels of student satisfaction. Structured to help learners develop professional-level skills that meet the demands of the highly competitive fashion industry, this bachelor’s in fashion design online also features a well-rounded liberal arts curriculum. All of UW’s acclaimed fashion faculty have impressive professional credentials. Students who pursue the New York option earn an associate of applied science degree from FIT in addition to their University of Wisconsin bachelor of science. Located in Mount Pleasant, Central Michigan University educates 20,000 students on its main campus and an additional 7,000 students through its online programs. The school’s bachelor of applied arts or bachelor of science in fashion merchandising and design focuses on emerging and well-established technologies in the fashion industry. The BAA requires a minor, while the BS does not. For the bachelor of applied arts, students can choose one of two degree specializations: product development or visual merchandising. The product development specialization prepares students for careers designing and marketing new fashion products. Courses concentrate on the fashion line life cycle and industry-standard technology tools. The visual merchandising concentration provides a detailed, in-depth analysis of the psychological and emotional processes that inform fashion-related consumer behavior. Coursework examines purchasing environments such as in-store displays, trade shows, advertising, and branding. Applicants to these bachelor’s degree in fashion design online programs should have a minimum GPA of 2.0. CMU accepts transfer students. Students must maintain a 2.7 GPA in order to graduate. Johnson & Wales University trains students for careers in management, marketing, merchandising, and public relations positions through its highly regarded bachelor of science in fashion merchandising and retailing. The Johnson & Wales program balances creative development with analytical and technical competencies. The curriculum focuses on key strategies for anticipating and tracking emerging industry trends. Graduates are prepared for exciting entry-level jobs in fashion retail, merchandising, marketing, and the textile industry. Students benefit from the skills and insights of well-established and experienced fashion industry professionals. Distance learners also have the option of adding a minor in human resource management to further expand their post-graduation career opportunities. The fashion merchandising bachelor degree online also features experiential learning opportunities such as internships and study abroad. Classes follow an 11-week class schedule. New students can begin the program on any of four start dates throughout the year. The bachelor of science in fashion merchandising management at Southern New Hampshire University focuses on developing knowledge and skills in five key areas: merchandise planning, application of retail theory, qualitative and quantitative data analysis, industry trend identification, and textile purchasing. Students learn how to simultaneously address the needs of vendors, retailers, and investors. The program features classes in textiles and color theory, the history of fashion and costume, sustainability in fashion. The curriculum also includes traditional business courses such as strategic management, consumer behavior, and supply chain management. Small class sizes ensure online students will receive personalized attention from qualified instructors. Classes are delivered in eight-week terms, with six terms per academic year. SNHU allows students to apply up to 90 transfer credits toward the fashion merchandising bachelor degree online. The university boasts an extensive and supportive alumni network, giving learners additional networking advantages as they transition out of school and into their careers. Although most fashion design or fashion merchandising programs have the same general requirements, specific details can vary between schools and programs. Certain degree tracks may offer unique courses or internship opportunities. For example, some schools have special relationships with the Fashion Institute of Technology in New York City, allowing students to spend time and learn at the FIT. Courses in an online bachelor's in fashion program differ based on the school and degree plan. While fashion design and fashion merchandising programs focus on different areas, they do share certain core courses. Below is a list of sample fashion courses found at many schools. Introduction to textile design: This course is an introductory-level offering that prepares students for careers as fashion designers. Students learn the basic technical and conceptual ways of using textiles in design. This course often includes introductory theory that enables students to apply their newfound knowledge to create projects. History of Western dress: This class is most common in fashion merchandising programs and teaches students a broad history of the industry. The course often operates as a liberal arts-style survey class, teaching students about style and dress from ancient history through the 21st century. As the course contains elements of art history, it often requires students to complete a significant amount of writing. Fashion retail management: This course prepares students for business and sales-related careers in the fashion industry. Students learn about merchandise management, retail strategies, and supply chain management. This is a common core course in fashion merchandising programs, although some fashion design programs also offer it to provide students with an understanding of how the industry operates. Apparel design: This course is a core requirement for many fashion design programs. It is an introductory class that covers the basic strategies, principles, and techniques for designing apparel and clothing. Students often research trends and create original designs. Fashion illustration: This class is another staple of fashion design coursework. Learners cover how to use different media to create original apparel design concepts. Students also learn how to draw the fashion figure and focus on topics such as the interrelated qualities of fabric, texture, garment, and pattern. How Long Does it Take to Get an Online Bachelor's in Fashion? The amount of time it takes to complete an online bachelor's in fashion depends on a few programmatic factors, the most straightforward of which is whether students enroll part-time or full-time. Full-time students generally graduate from fashion programs in four years, while completion times for part-time students vary widely. Additionally, students enrolled in cohort programs generally finish faster than students enrolled in self-paced, asynchronous programs. Cohort models require students to complete the same sequence of coursework with a group of their peers, creating a support system and a defined end date for the program. Students in asynchronous programs do not have scheduled class meetings but complete coursework at their convenience. Many students enrolled in asynchronous programs have full- or part-time jobs, which also leads to longer completion times. Most online bachelor's in fashion programs require students to complete between 120 and 124 credits. In general, students should make sure that their chosen school is regionally accredited before they enroll. When a school is regionally accredited, the entire institution has undergone a thorough vetting process and earned a stamp of approval from one of six accrediting organizations, all of which receive oversight from the U.S. Department of Education (ED) and Council for Higher Education Accreditation (CHEA). If a school is not regionally accredited, it has not met CHEA's quality standards. Alternatively, organizations that award national accreditation tend to work with schools or programs within a specific field. Students who pursue fashion degrees at art- and design-specific schools can look for programs that hold national accreditation from the National Association of Schools of Art and Design. However, there is no industry-standard organization that awards national accreditation to online fashion bachelor's programs. As such, students should focus primarily on ensuring that their chosen program is regionally accredited. The ED oversees federal educational policies and administration matters and coordinates federal educational assistance. CHEA focuses strictly on accreditation. Students can find a complete list of accredited schools on CHEA's website. In addition to location, a worker's experience influences their prospective salary. The following table includes data from PayScale, showing the expected salaries for retail managers, fashion designers, fashion merchandisers, fashion buyers, and supply chain managers as they advance in their respective careers. Students interested in an online bachelor's in fashion choose from two diverging paths. The path that each student chooses generally depends on whether they want to earn a degree in fashion merchandising or fashion design. Fashion design graduates can pursue design careers beyond the fashion field, including art direction and interior design. Alternatively, fashion merchandising graduates pursue more business-related positions in sales or supply chain management. Fashion design students generally have more flexible work environments than fashion merchandising graduates, who tend to work 40 hours a week in 9-to-5 settings. Fashion designers create original designs for clothing, footwear, and/or accessories. They create sketches that other workers use to turn designs into reality. These professionals often work in wholesale, manufacturing, or apparel settings or for theatre companies. Fashion designers generally do not need an advanced degree. Most fashion designers work in New York or Los Angeles. These workers buy products for their companies to resell or use. Purchasing managers oversee purchasing buyers and agents. Employees in the fashion purchasing field must often identify successful designs in smaller boutique operations that they think will sell in larger stores. Purchasing workers do not need an advanced degree. Interior designers do not require an advanced degree. About 20% of these professionals are self-employed, with the rest working for design services teams at architectural or engineering firms. Interior designers focus on both functionality and style, ensuring that a space is safe and beautiful by accounting for factors like material, lighting, and color. Art directors curate images, style, and the overall visual feel for movie and television productions, magazines, newspapers, and product packaging. They often oversee and manage an organization's art team. This career path does not require an advanced degree, and about 60% of art directors are self-employed. Sales managers direct and oversee sales teams for a variety of organizations. Students who have a degree in fashion merchandising qualify for these positions, which do not require an advanced degree. This position often requires professionals to work extra hours on nights and weekends and engage in a fair amount of travel. Advancement in the fashion industry has as much to do with who you know as what you know. As such, joining professional organizations to gain networking opportunities is particularly important for fashion graduates. Especially in central fashion markets such as New York City and Los Angeles, these organizations provide opportunities for prospective fashion designers looking to launch their careers. The ITAA promotes excellence, scholarship, and innovation in the fashion merchandising field. The organization offers networking events and access to the ITAA journal and other publications. The FIA organizes fashion industry meetups across the globe and provides a directory for members searching for specific opportunities in specific places. The IACDE focuses on bringing together talented fashion executives by hosting global conventions and forming local chapters, which offer events and programming to support executives. The NRF advocates for policies that benefit its members, which include retailers and students across the nation. The federation operates over 50 committees, which focus on policy and operations and offer networking opportunities. The AAPN advocates for sourcing and producing apparel products in the Americas. The network operates its headquarters in Atlanta and has branches across North, Central, and South America and in Asia and Europe. All students should make sure to complete the Free Application for Federal Student Aid (FAFSA), which provides access to several different streams of federal funding, including work-study opportunities, loans, grants, and scholarships. Students pursuing fashion or visual-arts related undergraduate degrees can also access many memorial scholarships. Additionally, the YMA Fashion Scholarship Fund is one of the largest scholarship organizations in the field; all students pursuing a bachelor's in fashion design online should be sure to apply to this fund.